That the shoes were no longer mere accessories we knew a long time, but with the new collection Fall Winter 2011 2012, Giuseppe Zanotti fails to impress with the real works of art (and sometimes daring) that create a unique and extraordinarily glamorous look. Following the mood seen on the catwalks of fall winter 2011 2012 fashion collections Even shoes by Giuseppe Zanotti rediscovering the animal style (But contemporary, with a mixture of textures and materials), python and snake for cleavage, the 70s boots and the great return of Ankle in all its forms, from version to be checked at night, to the suede wedge to sporting ground level and pointed with elastic at the ankle. The shoes do not know half-measures and the grunge style alternating bass high heels or thick or thin which give character and glamor to the look and match with jeans and dresses both mini-Seventy. 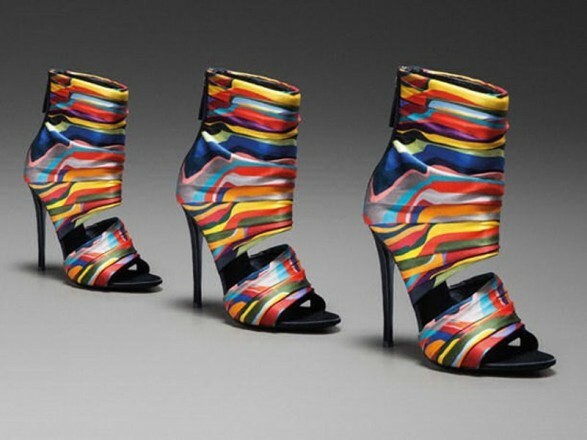 Giuseppe Zanotti shoes are born, in fact, from a harmony not obvious trends and leathers, as explained by the same designer to present a model of the collection. This is a sandal made of four different types of leopard printed pony who plays in a totally new-style animal creating a model that wraps the foot gritty. Then focus on the materials used (many different, intertwined with each other and combined with the use of the chamois, the snake, horse, leather, paint ….) but also on color. In addition to the always classic black, the fall-winter collection sees the great return of the leather color (very ’70s) especially for leather boots and sandals in suede and fluorescent colors (yellow, purple, orange ..) on the suede.